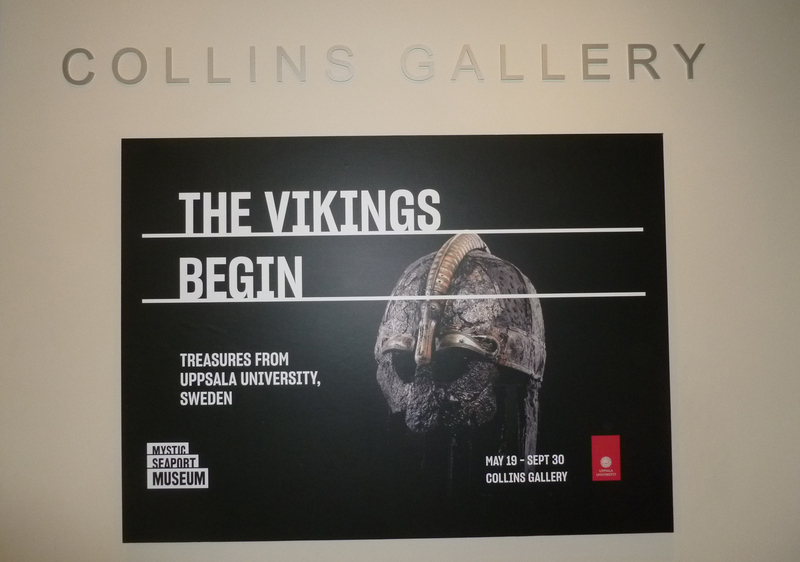 A real gem is in the Collins Gallery in the Thompson Exhibition Building at the north end of Mystic Seaport Museum – “The Vikings Begin: Treasures from Uppsala University, Sweden”, a beautiful exhibition with artefacts from the time leading up to what is called the Viking Age. 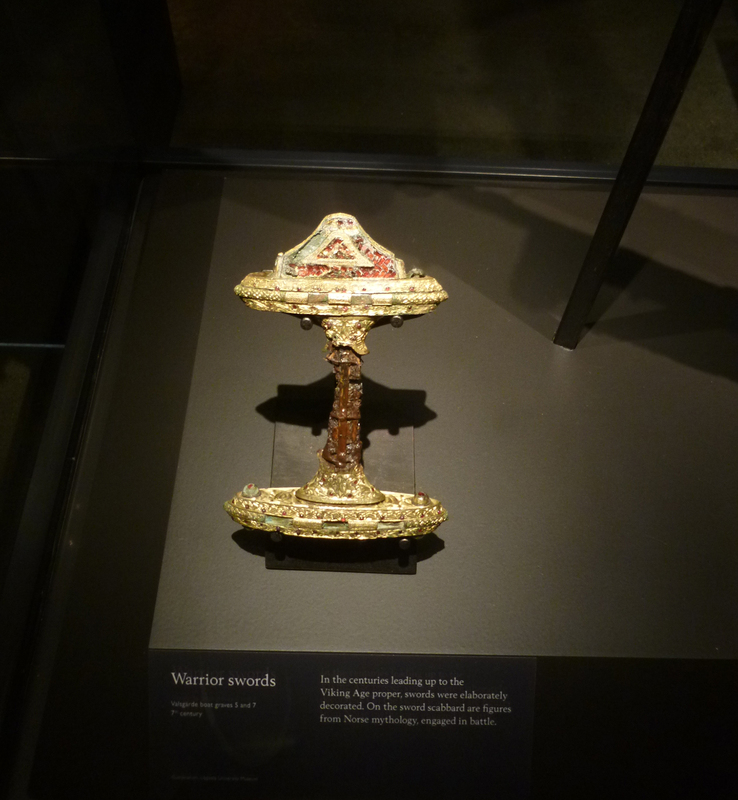 Göran R Buckhorn takes a closer look at some Viking treasures from Uppsala, Sweden, which have found their way over the pond to Mystic Seaport Museum in Connecticut. On 2 October 2016, the 115-foot, wooden, clinker-built Viking longship Draken Harald Hårfagre docked at Mystic Seaport Museum in Mystic, Connecticut. After a 23-week long voyage of nearly 7,000 nautical miles from her homeport in Haugesund, Norway, the reconstructed vessel had reached her last destination in North America, and “Expedition America 2016” had come to an end – read more here. 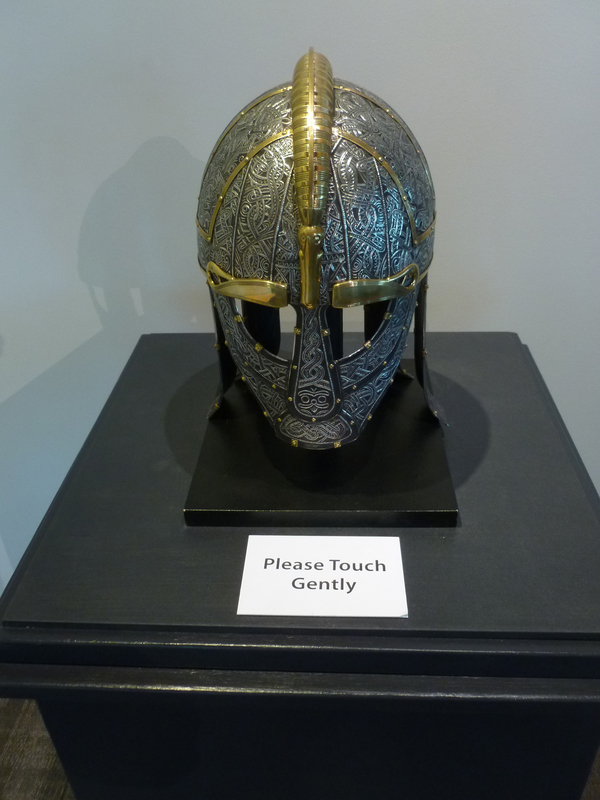 Outside the Collins Gallery is a replica of a Viking helmet for everyone to touch to feel the rich ornaments. On 19 May this year, a second wave of Vikings ‘invaded’ Mystic Seaport Museum, when the institution opened two exhibitions related to the Norsemen: The Vikings Begin: Treasures from Uppsala University, Sweden and Science, Myth, and Mystery: The Vinland Map Saga. 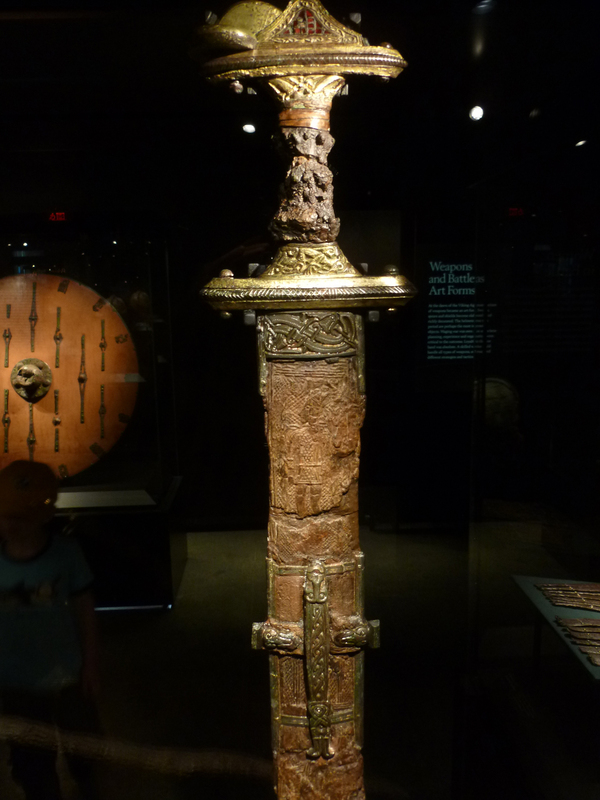 Because of the magnitude of both exhibitions, this article will only cover The Vikings Begin. 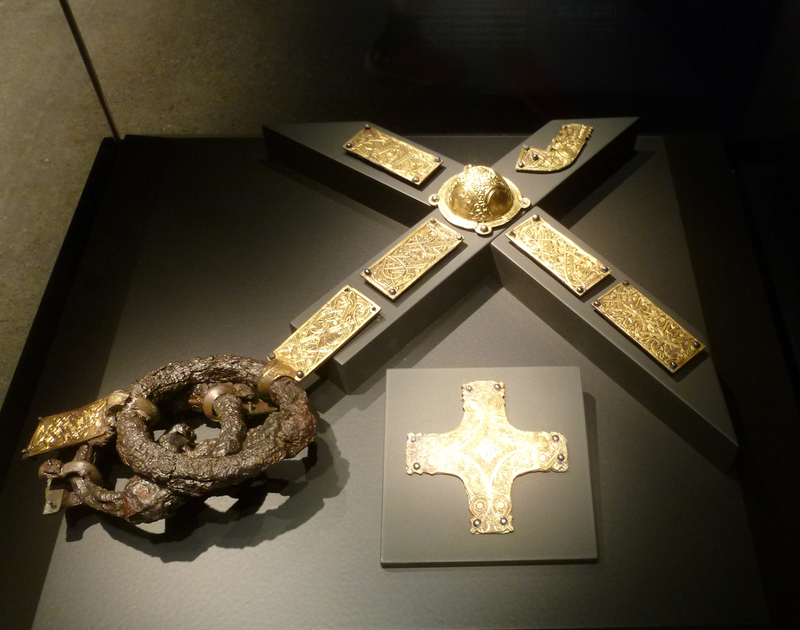 According to the exhibition, the Viking society started to dominate present-day Sweden, Denmark and Norway around 750 AD (some sources say around 800 AD). Many of the beautiful artefacts in The Vikings Begin are from the 7th century, the period leading up to the ‘official’ Viking Age. In 2015, three prominent Viking Age researchers at Uppsala University, Neil Price, Charlotte Hedenstierna-Johnson, and John Ljungkvist, received funding for the ten-year project “The Viking Phenom­enon”. One aim of the project is to closely study the emergence of Viking society by looking at the developments within the Scandinavian Iron-Age culture that existed before the Vikings. Although the project is only just beginning, some interesting insights have already emerged. 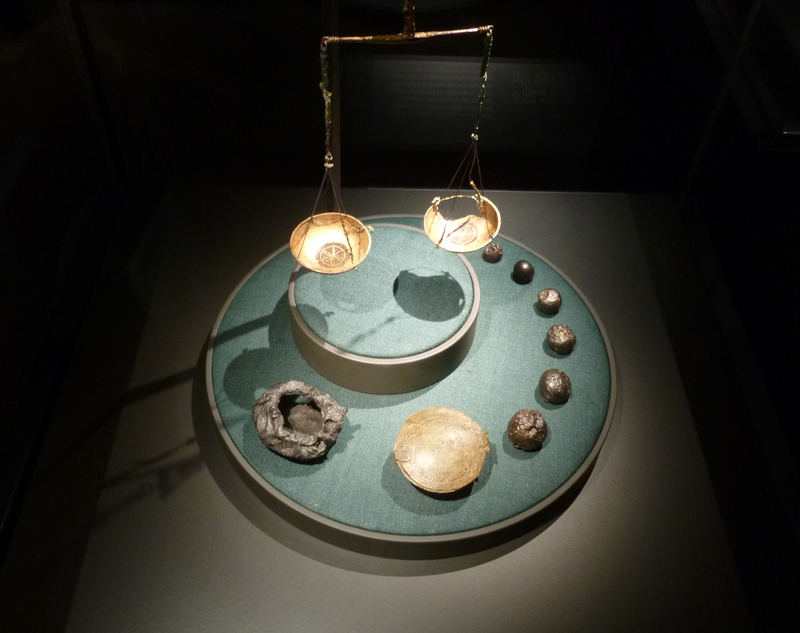 The rich archaeological finds from graves in east­ern Sweden – treasures that are held at Gustavianum – tell a more complex and interesting story about why and when Vi­king society actually began. 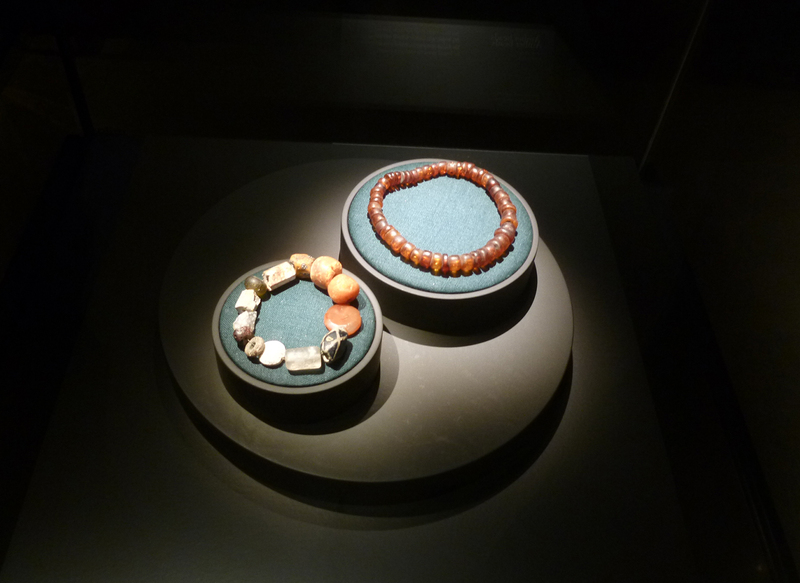 Jewelry, like coloured beads and stones, were hugely popular during the Viking Age. All glass was imported from the Mediterranean and very expensive. 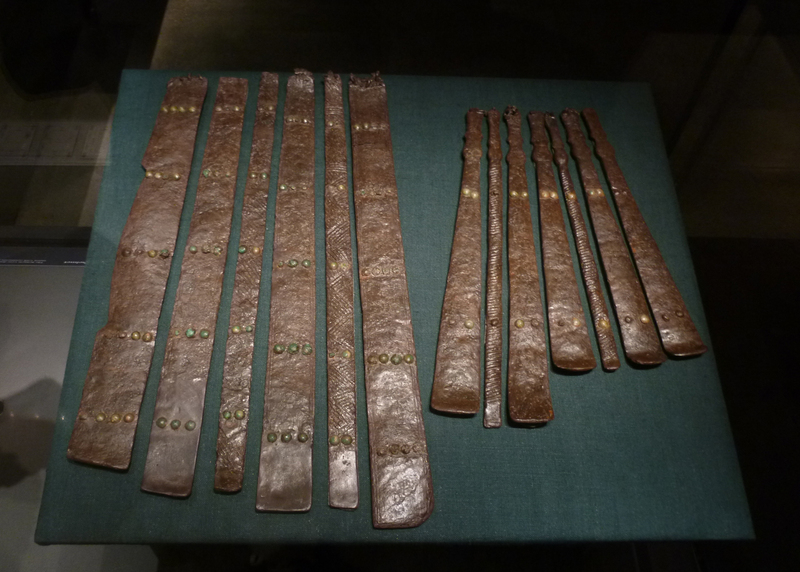 Many of the artefacts in “The Vikings Begin” are from boat graves found at Valsgärde, outside of Uppsala in Sweden. This kind of burial used a vessel or a boat into which the dead person and grave goods that the person would need in the afterlife, as tools, weapons, food, etc., would be placed. In some graves, for the rich and powerful, even horses could have been put in the grave. Shown in the picture is a part of a grave boat, a clinker-built boat. Observe the arrows in a quiver (down on the right in the image). 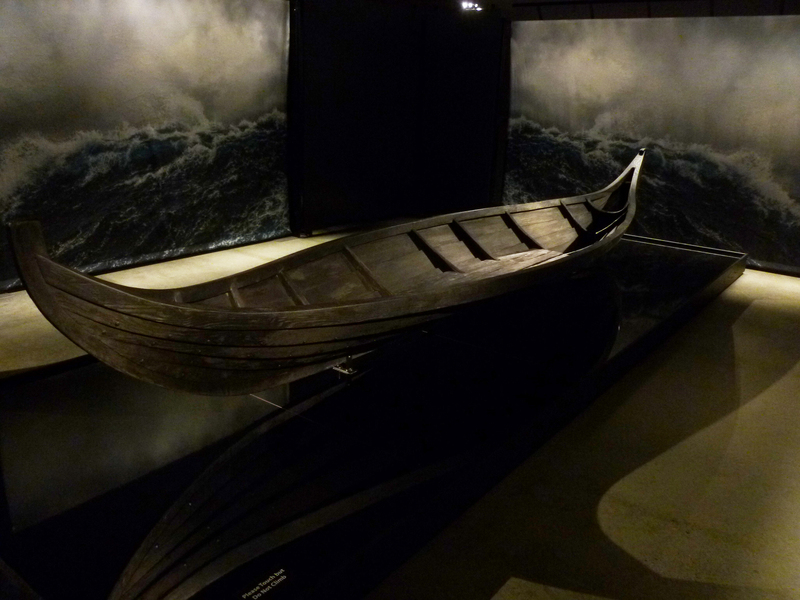 What would an exhibition about the Norsemen be without a boat? Here is a reconstructed boat used to sail or row in shallow waters. The Vikings Begin is in the Collins Gallery, the Thompson Exhibition Building, located at the north end of Mystic Seaport Museum. You walk through the doors into the dimly lit gallery, which gives the exhibition a mystical touch. The exhibition space is divided into different sections showing, to mention a few, Boat Graves, War and Warriors, Power and Gods, Trade Posts and Cities and The Wider World. At the time of the Viking Age and the time preceding it, Scandinavia was a maritime society. The collapse of the Western Roman Empire left a power vacuum in Europe, which allowed the Scandinavians, the ‘raiders and traders’, as Dr Hedin calls them in her article, to travel from the North along the coasts and rivers in the west, east and south. These voyages took the Norsemen to the lands across the Baltic Sea but also to England, France, Orkney Islands, Faroe Islands, Iceland, Greenland, Kiev, Constantinople and as far as South Asia to the Tang dynasty’s China – and North America to what the Norsemen called Vinland, which Viking explorer Leif Eriksson reached around the year 1000. On the left is a glass beaker probably from northern Italy. 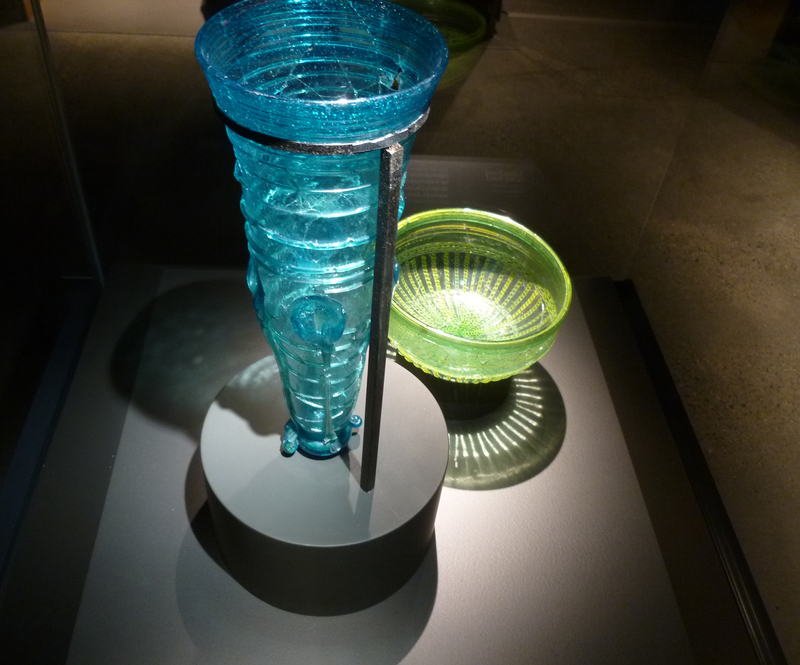 On the right is a green glass bowl, 8th century, probably also from northern Italy. A metal tread is going around the bowl. Collapsible scale, leather pouch with silver pieces. The Vikings used pieces of metal as currency by weight. Glass beads mounted with brooches. 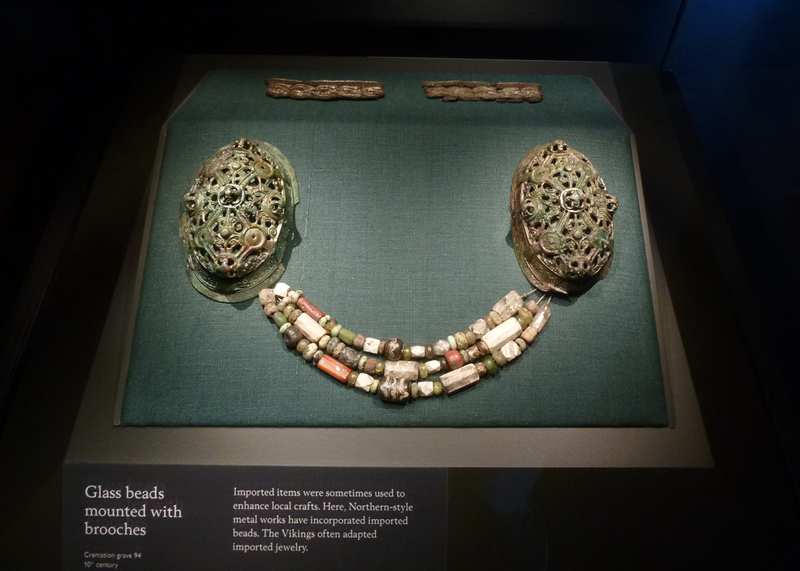 Northern styled metal have been incorporated with important beads. The Vikings settled peacefully in far-away lands where they had traveled to trade and explore. Some of the important sources of Viking customs were written in Arabic, for example, by Ahmad ibn Fadlan, a Muslim civil servant from Baghdad, who traveled to places along the Volga River where the Rus people lived (the Rus were originally Vikings who had emigrated from present-day Sweden). Many Arab gold and silver coins have been found in Viking graves around Scandinavia – more than 80,000 Arabic silver dirhams have been found on the Swedish island of Gotland alone. These findings show the noteworthy and widespread network of trade done by the Scandinavians during the Viking Age, which is pointed out by Anders Winroth, professor at Yale University, in his brilliant book The Age of the Vikings (2014). Professor Winroth’s book sheds new light on the Norsemen, their culture and their time. However, as everyone knows, the Vikings also had another, more violent, side. They plundered, looted and took slaves. They lived in a violent time, and their reputation for bloodthirstiness has stuck, even while others, Professor Winroth writes, Charlemagne, for example, who is regarded today as the “founding father of Europe”, committed genocide in the process of the unification of Europe, something which is largely forgotten nowadays. 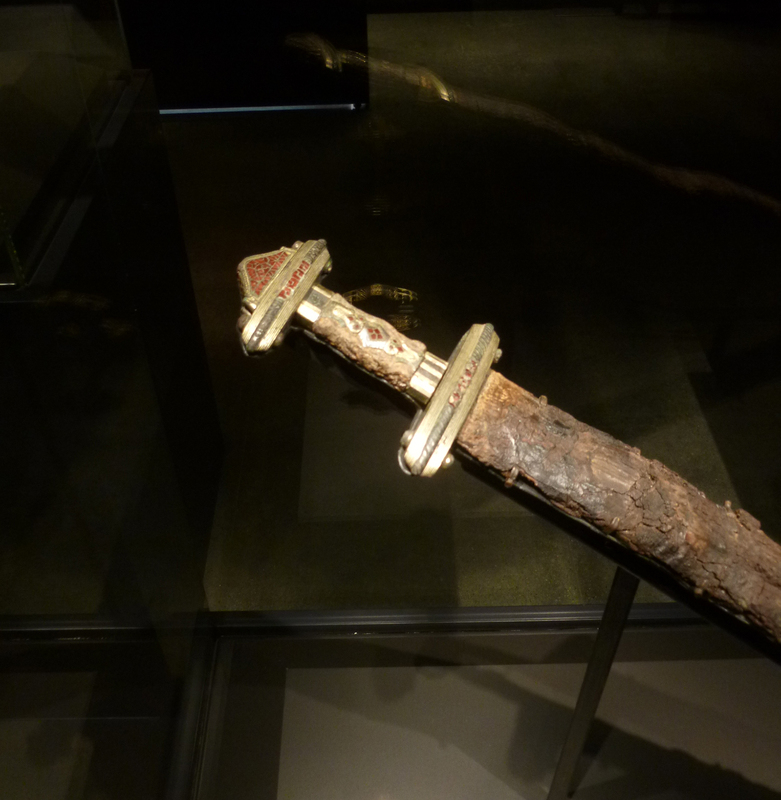 The Vikings Begin shows artefacts of the Scandinavians as warriors. 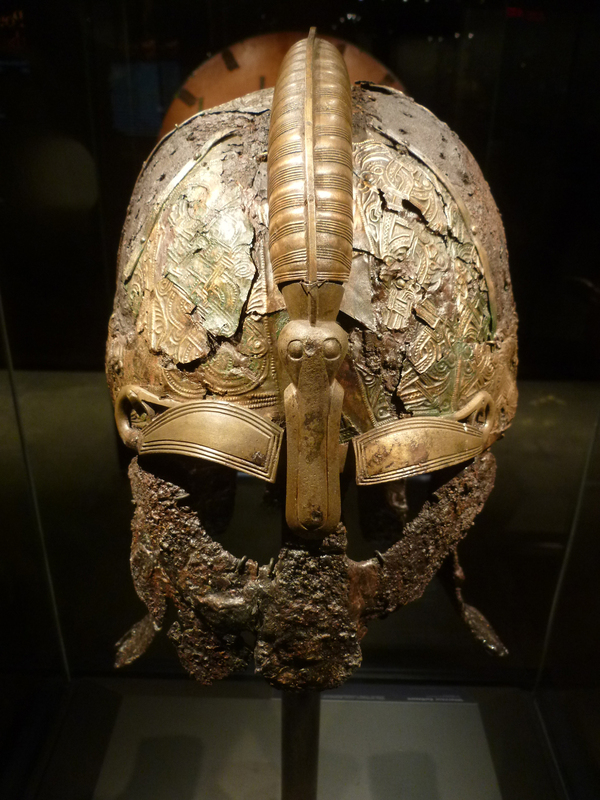 Beautiful helmets from the 7th century are on display – no horns on the helmets, as the Vikings never wore helmets with wings or horns! Next to the display case with the helmets are some magnificent swords and body armor in metal and leather. 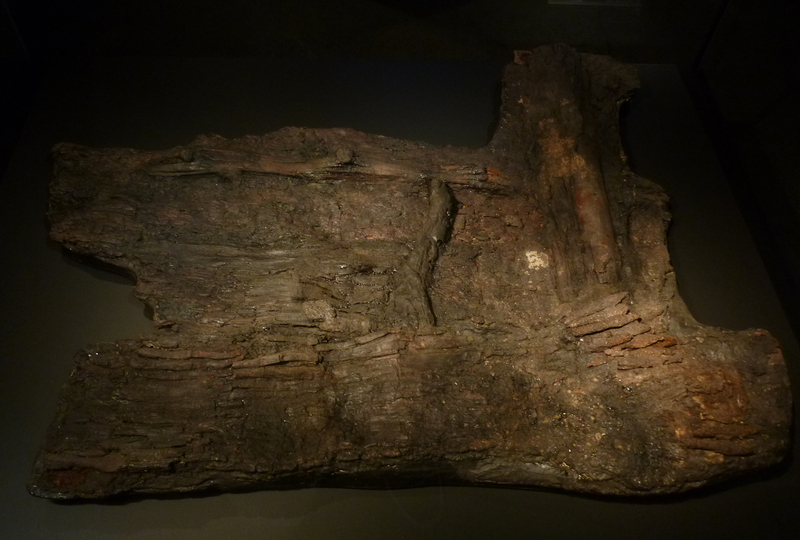 On display is also a wooden shield, but of course it is only the metal pieces that are originals as wood has deteriorated after more than 1000 years in the ground. 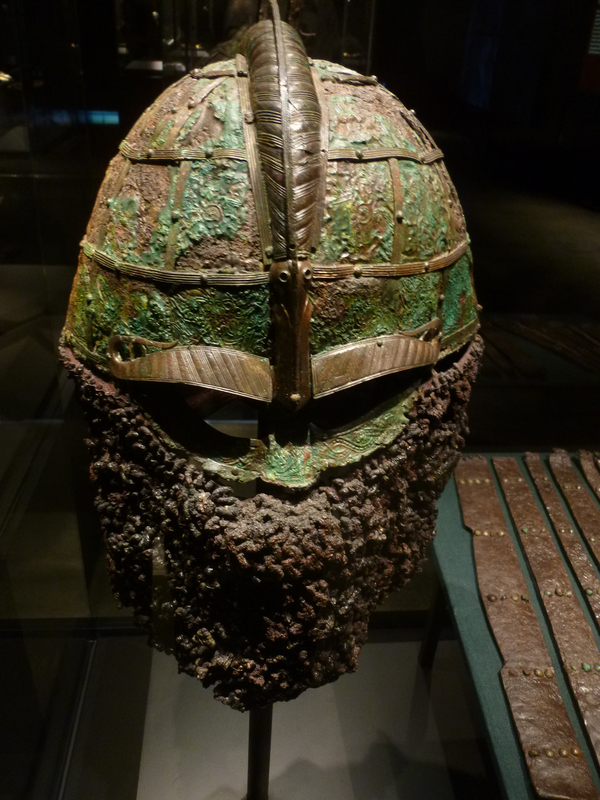 A warrior helmet from the 7th century. To demonstrate status, the helmet has ornaments with costly gemstones. A warrior helmet from the 7th century. Observe the serpent on the helmet. In Nordic mythology, the serpent Jörmungandr was tossed into the ocean by Odin. The serpent grew so large that it was able to surround the Earth and bit its own tail. Body armor from the 7th century in metal and leather. In the 1870s, Swedish archaeologist and ethnographer Hjalmar Stolpe excavated a warrior’s burial chamber at the Viking Age site Birka, close to present-day Stockholm. The grave was given the name Bj 581. Analysis made in 2014 gave evidence that the warrior in Bj 581 is a woman. Three years later, a team led by Charlotte Hedenstierna-Jonson extracted DNA from a tooth and a bone from an arm that conclusively proved to be that of a woman. The woman, now known as the Birka female Viking warrior, was buried with a sword, armor-piercing arrows, a battle knife, an axe, a spear, two shields and two horses and a full set of game pieces and a gaming board. The gaming pieces suggest that the person buried was a high-ranking combatant who was knowledgeable of strategies and tactics, according to an article in the American Journal of Anthropology from last September. The Birka female Viking warrior. Reconstruction of Birka Bj 581 by Neil Price. Horse harness from the 8th century. A horse was an expensive symbol of might and power. This gold-like decorated harness was high status of a Viking who could own such an animal. On the south deck of the Thompson Exhibition Building, where the “The Vikings Begin” is located, is a model of the Viking longship “Draken Harald Hårfagre”. 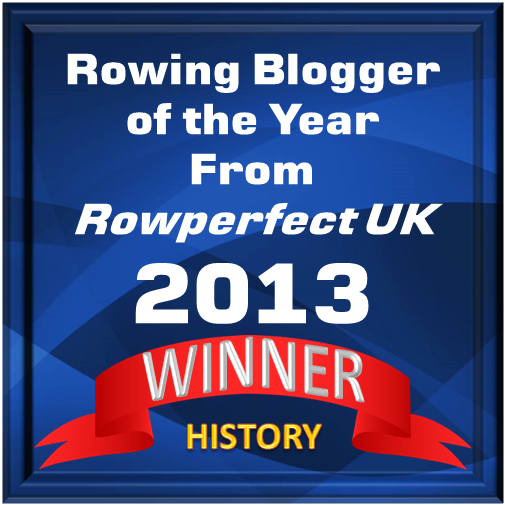 HTBS has written about this model previously. 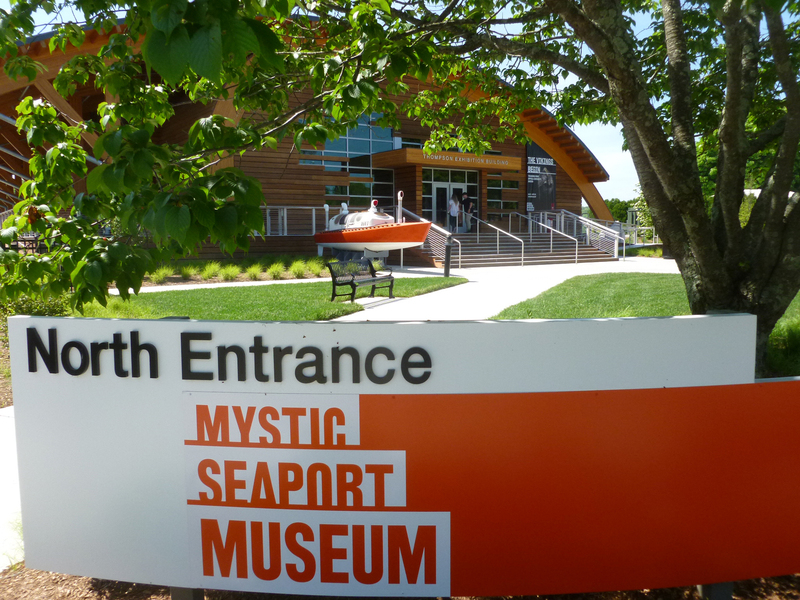 Mystic Seaport Museum is the exhibition’s first stop on a two-year U.S. tour for this travelling exhibition. This autumn it will go on to the new Nordic Museum in Seattle and then to the American-Swedish Institute (ASI) in Minneapolis. The Vikings Begin will be on display at Mystic Seaport Museum through 30 September 2018. More information about The Vikings Begin can be found on the Museum’s website. 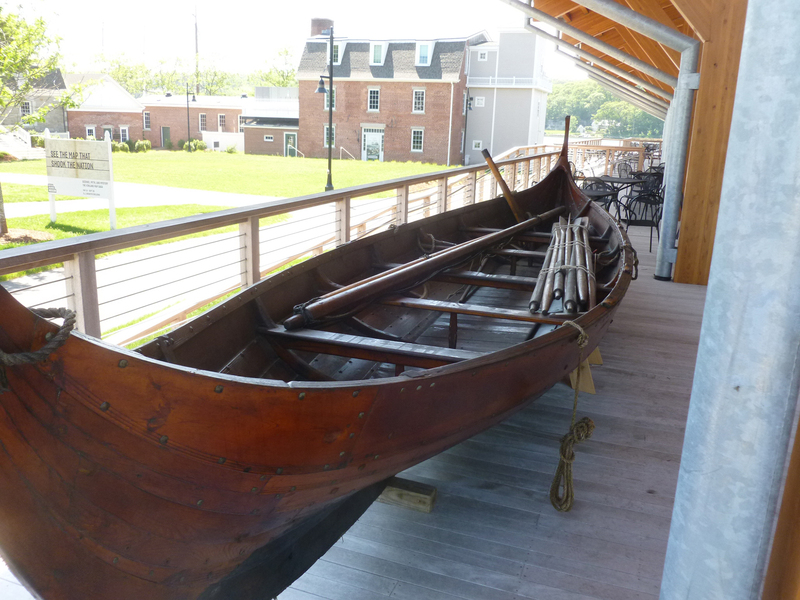 Not to be missed – on 16-17 June there will be Viking Days at Mystic Seaport Museum. Read more about the special activities during that weekend here. Draken Harald Hårfagre will still by at the Museum during this weekend. Photography © Göran R Buckhorn. Next Will the Bulldogs Bite?